Lightning data is of particular importance to enable the recording, analyzing and predicting of thunderstorms. 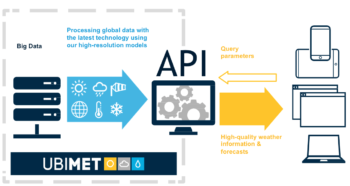 With the global lightning detection system powered by nowcast, UBIMET is able to precisely identify storm cells and to issue detailed and precise severe weather alerts at an early stage. 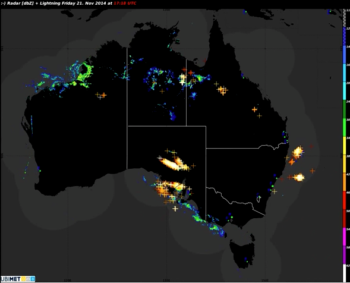 nowcast is part of the UBIMET Group and has developed technology which enables the precise locating of lightning during a thunderstorm. The lightning detection technology was developed in 1988 at the Ludwig-Maximilians University in Munich, Germany. The lightning detection system consists of a sensor network that measures the electromagnetic radiation emitted by lightning. This data is used to calculate the exact discharge location as well as the strength, polarity and additional parameters of lightning, resulting in detailed and precise lightning data. View this quick video explaining how the network works. The highly developed antennae configuration, low detection thresholds and optimized sensors make it possible to record even weak discharges. This allows nowcast to detect cloud-to-cloud lightning as well as very weak cloud-to-ground lightning bolts. The latter are barely detectable by other systems or cannot be detected at all. The monitoring network localizes lightning by means of triangulation using at least five sensors. This is essential for the unparalleled spatial accuracy and minimized deviations. nowcast has perfected the “Time of Arrival” (TOA) method to an extent that allows the precise localization of lightning to approximately 75 meters. The patented low frequency 3D antenna enables the error-free processing of all signals emitted by cloud-to-cloud and cloud-to-ground lightning. nowcast not only detects the cloud-to-cloud lightning, it also determines the height. This information is used by meteorologists to draw conclusions regarding the type of thunderstorm and the storm’s development cycle. Due to the high importance of lightning data, in 2013, UBIMET entered into a strategic partnership with nowcast GmbH for the global expansion of the nowcast lightning monitoring networks.